Hey guys just wanted to post a quick and delicious recipe! I went to the Le Marche and all of the Cepes (mushrooms) were just screaming my name. So I purchased three big bunches of different kinds… chanterelles, oyster and good ‘ole white button. 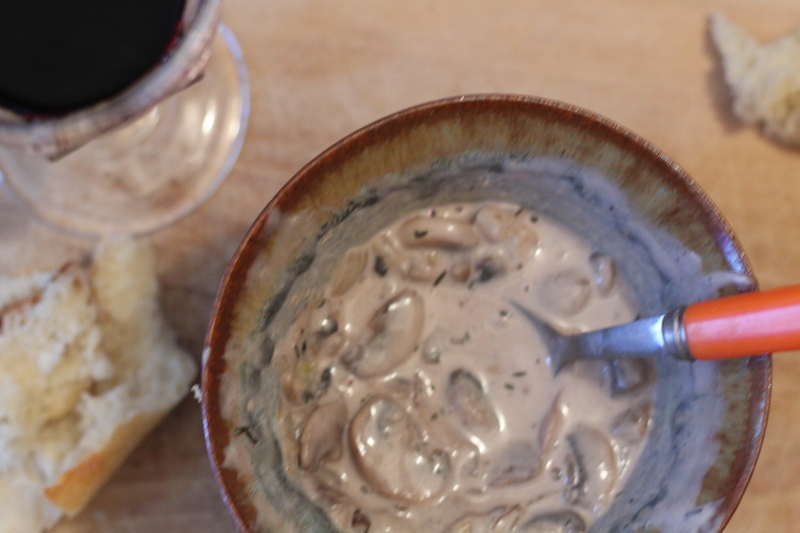 Then, I proceeded to make this absolutely scrumptious cream of mushroom soup…. complete with red wine, thyme, nutmeg and of course a little cream 🙂 This recipe is so simple and ultimately the perfect comfort food on a fall day. I have been purchasing a fresh baguette every evening from my new favorite boulangerie and tearing off a hunk to dunk in… YUM! I left my soup nice and chunky with mushrooms …however, it would also be incredible blended. Either way the flavor is amazing! In other news, the tasting I attended the other day ~ Les Rencontres Vinicoles was out of this world! You walk into a ritzy hotel in the 11 arrondissement, Paris… and you are immediately greeted with a badge, a wine glass and a booklet to keep your “tasting notes.” Again, this was a private event held for wine professionals only. The fact that I got to walk around and taste anything I wanted and fully be apart of this was so amazing! I tasted about 30 wines! Incredible. I have business cards and am already starting to network in Paris. It really interests people when I say I am from California… many of them have exports to Napa so it is a great introduction for me. Yay! On the agenda in school this week are Food and Wine pairings! We are studying this topic all week and you must attend actual pairings after the lectures! I am going to try my best to take photos. This is one of my favorite topics… I will never get tired of describing food…. 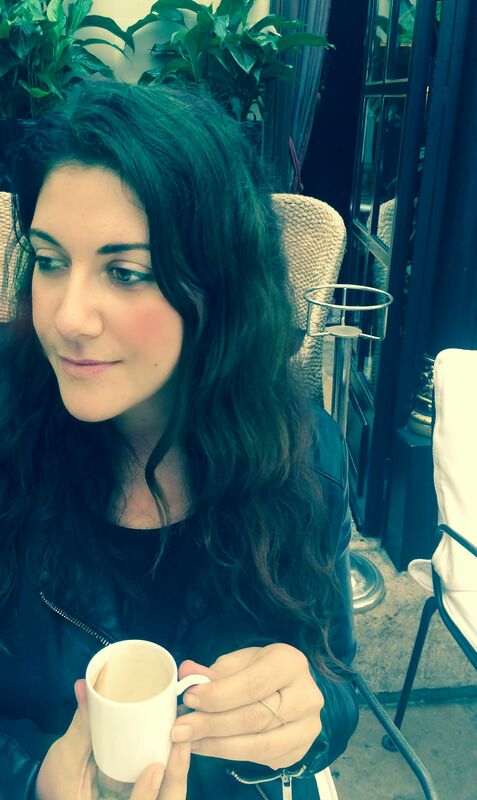 and reviewing menus…. and selecting wines to pair with! It feels so good to be back in the Paris Cafe Life. So lucky to call this home! Melt butter in a large saute pan. Once melted and foaming, add onion and sauté until golden. Add garlic and sauté another 5 minutes over medium heat. Salt and pepper this mixture well. Then, add mushrooms. Saute until deep caramel brown and golden… about 10 minutes. Add salt, pepper, and thyme. Add flour and cook for 2 minutes. Slowly add broth. Then pour in red wine. Stir constantly for 1 minute. Then add in 1/2 n 1/2. Add nutmeg. Now taste and add more salt and pepper. Add bay leaf and cook for 10 minutes over very low heat. Taste and adjust but it should just be delicious! Krista..your soup recipe looks delicious! Can’t wait to try it and I’m excited to hear about your food and wine pairing week! Evelyn~ Definitely a good bottle of Cabernet Sauvignon! My favorite wine at the moment for the start of fall is Syrah! Hmmm. iPad went crazy. Meant to post that you are looking very French. Love it. Krista, thanks for sharing! I’m going to the Farmer’s Market this weekend to pick up the ingredients for this recipe! I’m looking forward to trying it. Looks like you are enjoying your time in Paris!